Fiction – paperback; Headline Review; 224 pages; 2003. Thirty years ago, Imogen’s older brother went swimming in the sea off the Cork coast and was never seen again. Now, convinced that he may be still alive, she pieces together their family history and puts it down in a book, hoping Johnny, “somewhere in the world, may read it and may pick up the nearest telephone”. This is the premise behind Jennifer Johnston’s This is Not a Novel, which was first published in 2002, making it her 13th work of fiction. When the story opens Imogen has just sold her late father’s house on the Lansdowne Road, in Dublin, for a “whacking amount of money” and has inherited a trunk full of family correspondence and mementos, many of them from her grandparents and great grandparents, which shed light on their involvement in the First World War and the pains and small tragedies of another time and place. The narrative is framed around the letters, press cuttings and diary entries Imogen finds in this trunk. Combined with Imogen’s memories surrounding the period immediately before Johnny’s disappearance and her memories from the current day, 30 years later, the book is a rich, elegiac tapestry of family history and deeply held secrets. Three decades on, Imogen refuses to believe that Johnny ever drowned because her brother was a brilliant swimmer, and until he took against his father, was on track to become an Olympic champion. His body was never found. At the time of his “death”, Imogen was in a psychiatric unit having lost the ability to speak and was thought to have had a nervous breakdown. She came of age during her confinement and was able to leave the institution without her parents’ approval. The reason for Imogen’s loss of voice is key to the story. While we learn very early on that her mother, Sylvia, does not truly love her and acts rather coolly and indifferently to her, it’s not until the latter third of the novel that we understand what triggers Imogen’s fragile mental health. It’s shocking, but the clues are there for the reader who looks carefully enough to find them. There’s a lot going on in this novel — about echoes of the past coming back to haunt the family, about unrequited love, familial love and acceptance of differences. Two key characters — Bruno, the young German teacher who befriends Imogen’s family and becomes her first love, and Mathilde, the home help who escapes the Nazis and reinvents herself as a devout Catholic — are reminders that Ireland’s neutrality in both the First and Second World Wars is not without consequence. 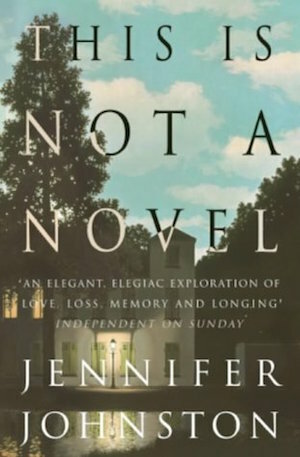 I really loved This is Not a Novel. It’s very much typical Jennifer Johnston fare (I’ve read and reviewed much of her exhaustive back catalogue now) and features her trademark focus on nuance, the small hurts that render people emotionally fragile and awkward mother/daughter relationships. It’s a good a place as any to start if you have never read any of this author’s work before. This is my 15th book for #20booksofsummer. I have no memory of buying it — I suspect it might have been on one of my short trips to Dublin at some point — but I do know that it’s been in my TBR for at least five years. I had been saving it up, because I only have a few Johnston novels left to read and I don’t want to get to a position where I’ve finished all her work because that means I’ll have no new JJ novels to discover. I reckon you shouldn’t have much trouble finding a cheap second hand copy online. Having recently complained about the length of my tbr list this is going to have to go onto it because I am interested to know why Imogen lost her voice. I had a similar experience and I am wondering just how much else we might have in common. I’ve read three books in the past fortnight where the characters have lost their voice, all because of traumatic events: a teenage girl who has a baby in a public toilet (Nicole Trope’s The Secrets in Silence), a teenage boy who discovers his parents’ dead bodies (Eva Hornung’s The Last Garden) and now poor Imogen in this Jennifer Johnston novel (I won’t tell you what traumatises her, but it’s nowhere near as bad as the previous two examples I’ve just mentioned). I’m interested in the swimming side. A lady was rescued in the Adriatic (I think) after 10 hours, just recently and really, lots of competent swimmers could manage 10 hours/20 km if the water wasn’t too cold, the big problem is working out where you are in relation to the land. Apparently that lady (she was British) jumped off the boat to avoid her husband who was argumentative! She says she survived by singing and by using yoga techniques !!?? I like this one a lot. It’s structured beautifully. She’s really good at structure. I read a horrible critical paper about her work which complained she used the same techniques over and over and I thought, well, who cares, she does it so beautifully and it works so well.